For sites and integrations where additional security measures are required, VideoWhisper Web Applications support login session check on Wowza RTMP side. This is used to make sure no clients will be able to connect to rtmp server without having previously logged in on the website (with the _login.php scripts for php editions). When a new client tries to connect to RTMP server with a session name, rtmp application will check on the web server if that client session exists. If web server does not confirm that client logged in, rtmp server will reject the connection. RTMP server will also check for a webKey that needs to be configured same way on rtmp and web server: this will prevent connections in case of web domain hijacking (only web server and rtmp server know the key, client app does not). Usually, each installation will require its own rtmp side that checks session info with that installation. Otherwise you will have to tweak scripts to check on all installations. This Wowza SE functionality is optional and can be disabled by leaving those properties blank. Then restart WowzaMediaServer service. For troubleshooting check Wowza access logs. If errors occur in the error logs submit a ticket to VideoWhisper about this. 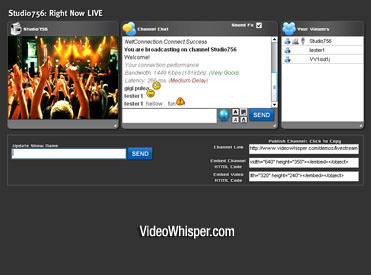 Configure settings.php to use the videowhisper-web rtmp address. To integrate this on other editions or installations you will need to copy the 3 files mentioned above to installation folder and include rtmp.inc.php in the _login.php scripts that authorize the user. Other changes could be required depending on particularities of each integration. 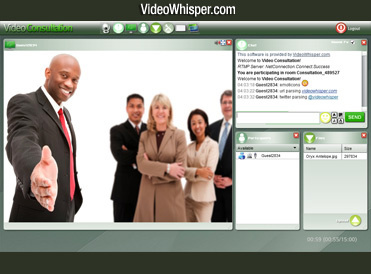 In addition to session login control, VideoWhisper rtmp side for Wowza can also provide RTMP Session Control (special licensing is required for 3rd party servers). This can be used to monitor 3rd party clients, other than VideoWhisper applications, like Wirecast, Flash Media Live Encoder (FMLE), Open Broadcaster Software (OBS), iOS/Android GoCoder app for rtmp live broadcasting. In example, if a broadcaster connects directly with an external encoder application, the website scripts can be notified about this to show his channel as LIVE. Also web scripts can communicate back to rtmp server to disconnect a client when necessary.